Just a short post this week sharing three articles that I read this week. The first is statistics about Women with Parkinson’s from the conference I just attended. 89 percent stated that they would participate in women and PD meetings if any were available in their area. The potential breakthrough comes from a recent focus on alpha synuclein, a protein found mainly in nerve cells. It is so biologically obscure that scientists aren’t even sure of its purpose. What they do know is that the protein can deform, or what scientists call misfold, and gum up into clumps called Lewy bodies, which litter the transportation system that nerves rely on. The nerves die. If enough die, your body stops producing the dopamine necessary for normal functioning. You have Parkinson’s disease…. the discovery has given scientists a target for therapy. Their new weapon? Vaccines, or more generally, immunotherapy — an approach that has kickstarted the kind of outbreak you can cheer for: loads of biotech investment and clinical studies. The third article, The New Prescription for Parkinson’s: Puttering, comes from The Michael J Fox Foundation. A recent paper from The University of Michigan shows that more everyday physical activity, perhaps more so than vigorous exercise, is associated with less severe motor symptoms. So my best advice is to just keep on moving! 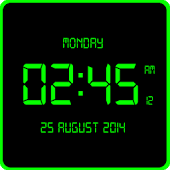 Of course we all know that the digital clock reminds us of our ongoing sleep problems related to Parkinson’s. For those of you who are not Jewish, a Shofar is a ram’s horn that is blown on the holidays Rosh Hashonah and Yom Kippur in synagogues. 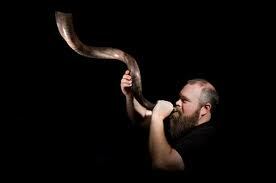 Can you imaging blowing the shofar everytime you wake up during the night? My neighbors would have the police out in no time. At this time of year, we pray for a sweet and healthy New Year. It is a new beginning, much like the secular New Year on January 1. According to Jewish tradition, we are being judged by G-d for the coming year during the 10 day period encompassing the two holidays known as the High Holidays or the Days of Awe. We pray that we will be written in the book of life. For those of us with PD, let’s also pray for the breakthrough in treatment that seems so close. And of course, wishing all of you much good health in the coming year. Tomorrow I will be flying to New Jersey to attend the Women and PD Conference sponsored by the Parkinson’s Disease Foundation. One of the requirements of the conference is that the participants plan an event(s) for women in my community with PD. 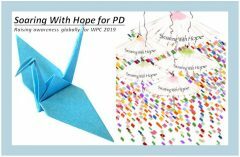 If you have any thoughts about an event you would like to see happen in the Los Angeles area for women with PD, please e-mail your ideas to me by Friday. I have a few ideas, but your input will be valuable as I try to determine what type of event or program I will be planning. In addition, please let me know if you want to work with me on the event.